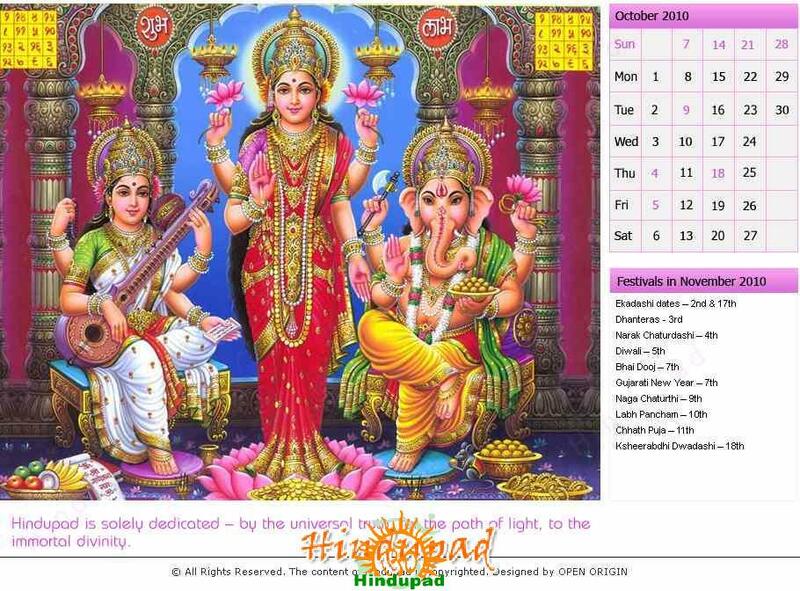 Hindu Calendar November 2010 is here to download for free. As Diwali or Deepavali is the major festival in November month of 2010, the wallpaper is designed with the image of Shri Maha Lakshmi Devi, along with Lord Ganesha and Goddess Saraswati. The list of important festivals in November 2010 is also given in the desktop Hindu calendar. Some of the other big festivals in this month are – Dhanteras, Bhai Dooj, Gujarati New Year, Chhath Puja, Hari Bhodini Ekadasi, Ksheerabdhi Dwadashi, and Kartik Purnima. November 2010 coincides with Ashwin and Kartik month in Telugu, Kannada, Gujarati, and Marathi calendars whereas in North India Hindi calendars it is Kartik mahina 2010 and Margasirsha month 2010. Here you can get the list of other major festivals and auspicious days in November 2010. Click here to get the daily Panchangam (Daily astrology) details of November 2010. November2010 calander is nice. But month name appearing as October. Pl correct.